Monitor your babys heartbeat during pregnancy in the privacy of your own home. The BabyBeat fetal home Doppler(tm) allows you to listen to your babys heartbeat with the same high-quality Doppler instrument used in your doctors office. With BabyBeat fetal Doppler you can hear the true sounds of your babys heartbeat as early as 10-12 weeks into pregnancy. The Baby Beat Doppler for fetal monitoring is the highest quality fetal heartbeat listening device available. BabyBeats Home Doppler uses the same ultrasound technique that has been used by doctors around the world for more than 30 years - to pick up the sounds of your babys heartbeat. The FDA has cleared this unit for fetal monitoring by mothers in their own homes with the approval of their physicians. This instrument is not a microphone used to amplify sounds. This Doppler instrument is used by physicians worldwide. Have the reassurance of hearing your babys heartbeat. Listen to the true sounds of your babys heartbeat as early as 10-12 weeks. Share the joy of pregnancy with your family and friends. With BabyBeat, you can simply count the beats to get the heartrate. BabyBeats Doppler comes with a 2 oz tube of ultrasound lotion, audio tape to help distinguish sounds you may hear and record your own babys heartbeat, instruction manual, helpful tips and a 9 volt battery. The BabyBeat/Display Doppler for fetal monitoring offers all the great benefits of the BabyBeat with the added bonus of giving a digital readout of the heart rate. The BabyBeat is the highest quality of fetal heartbeat listening device available. BabyBeats Home Doppler uses the same ultrasound technique that has been used by doctors around the world for more than 30 years to pick up the sounds of your babys heartbeat. The FDA has cleared this unit for use by mothers in their own homes with the approval of their physicians.This instrument is not a microphone used to amplify sounds. This Doppler instrument is used by physicians worldwide. The BabyBeat/Display gives you a digital readout of beats per minute. No counting, it accurately counts it for you! 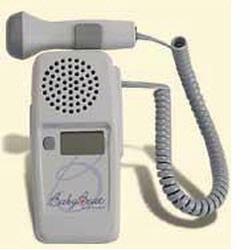 BabyBeats Doppler comes with a 2 oz tube ultrasound lotion, your choice of CD or cassette tape to help distinguish the sounds you may hear, instruction manual, helpful tips and a 9 volt battery. On how often to use, we always recommend that you discuss this with your healthcare provider although it is regulated by the FDA to be safe for continuous use.